Amanda Lenher was diagnosed with 1b1 cervical cancer on 8/18/16. Since that time she has referred to her cancer as "Ursula" since "cancer" is such a horrible word. Since August she has gone through a radical hysterectomy, chemo and radiation. She has been in great spirits through the whole process and we had high hopes we were done with Ursula when Amanda had clear scans in October. Unfortunately, she has been having extreme abdominal pain over the past month and after some scans and a biopsy, 2 soft tissue nodules were found and they are without a doubt more cancer. They are treating these new spot as stage 4 because it's the same cancer and it has moved. We are waiting for insurance to approve the Pet Scan which will give us the best idea of what we are dealing with and what the treatment plan is going to be. In true Amanda fashion, she has named the 2 new spots after Ursula's eels Flotsam and Jetsam. 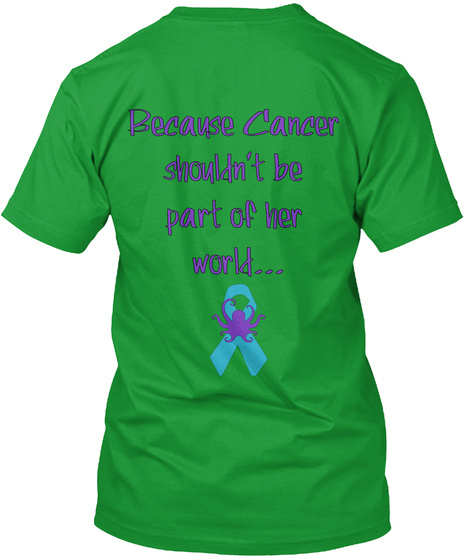 With her continuing her battle, I wanted to create a t-shirt that will show her how much she is loved and supported by others and provide a little financial relief in this extremely stressful time. When you buy a shirt, please post a picture and use hashtag #BanishUrsula so Amanda can see how much she is loved! Thank you for your support.